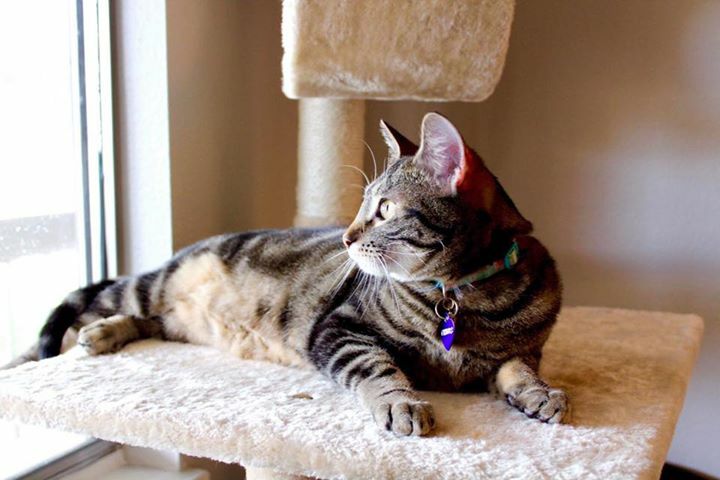 Posted: February 20, 2016 Category: Vet Blog Post! In honor of Dental Month, we wanted to share a little about Tug and his visit to Parkside Animal Health Center in Aurora. 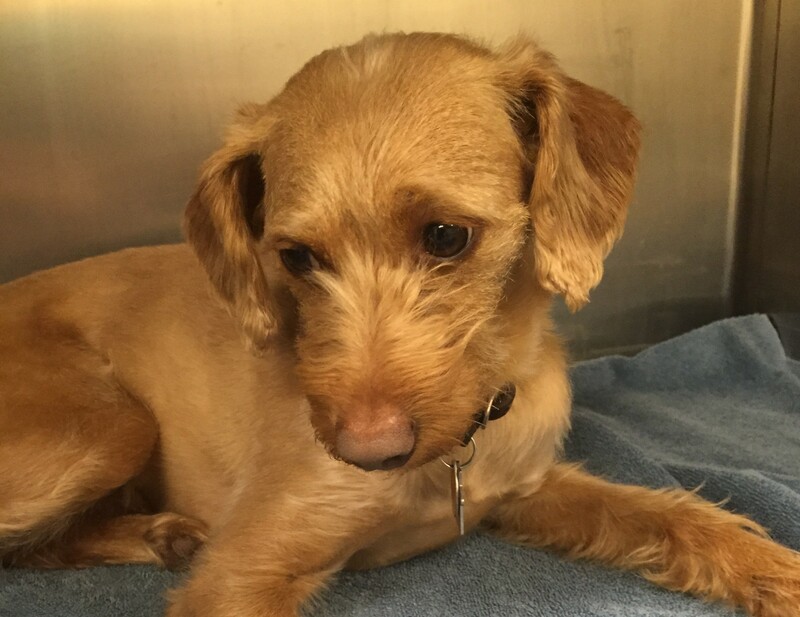 He came in to update his heartworm test and get a vaccine, but during his exam we found a fractured upper right tooth. Tug had been hiding this from his family at home, playing and eating normally, but had likely bitten down onto something hard and broke it several weeks before. Tug is being shy, pretending everything is normal. 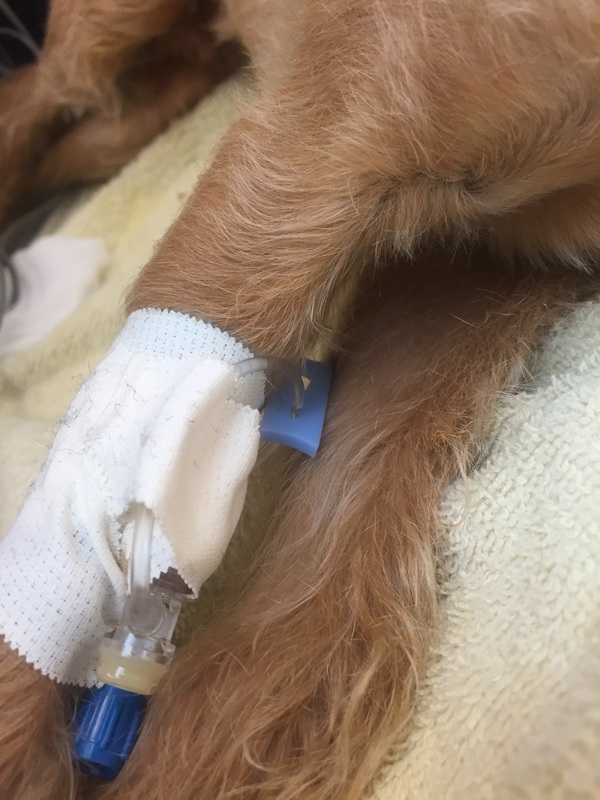 We gave Tug some sedative and pain medications and put in an IV catheter. We shaved fur over Tugs front leg and placed an IV catheter for medications and fluids during his dental procedure. 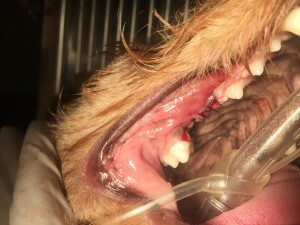 We were then able to put him under anesthesia and place an endotracheal tube to protect his airway. This is a picture of Tug’s broken tooth, once he was completely under anesthesia. He was hiding quite a painful thing! This is called a slab fracture, where the entire side of the tooth shears off like shale, leaving the pulp of the tooth susceptible to pain and infection. 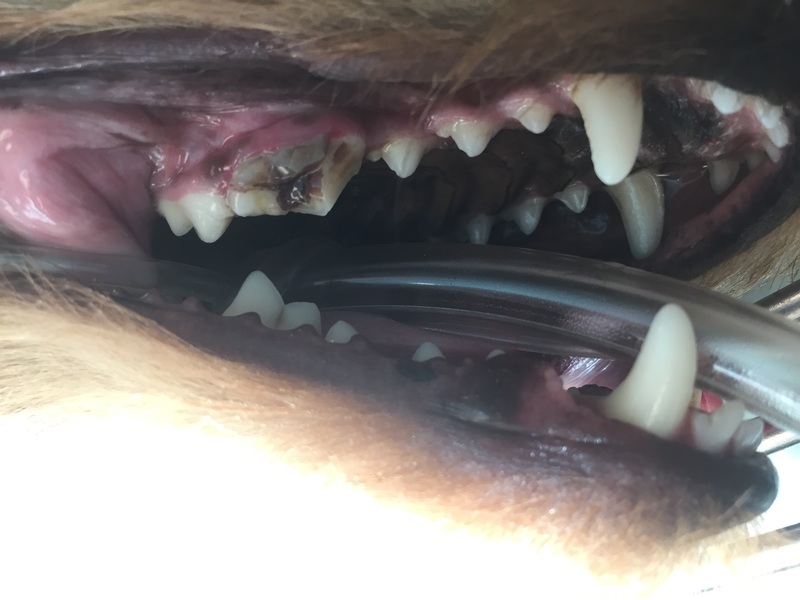 We took x-rays of all of Tug’s teeth to make certain we weren’t missing any other problems. 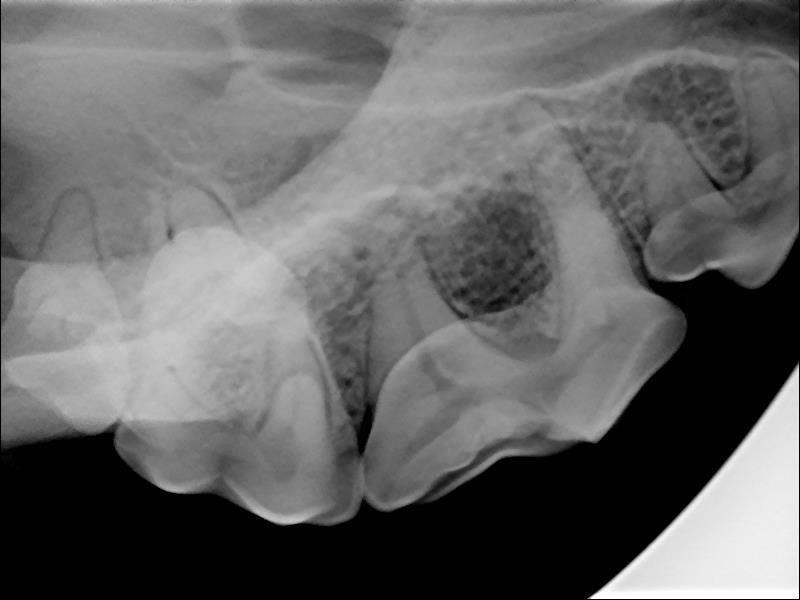 This x-ray of Tug’s broken tooth shows the pulp cavity (the dark middle part of the tooth full of vessels and nerve ending) being exposed to the outside world. The pulp of this tooth is exposed to the outside world. We had to cut the gingiva from around this tooth, divide the tooth into its 3 individual root, and remove each root separately. These large tearing/chewing teeth on the side of the mouth are built similarly to drywall anchors, so they are very strong and durable, but also technically difficult to remove. Luckily, all of the roots came out cleanly, which we confirmed with an x-ray after the removal. 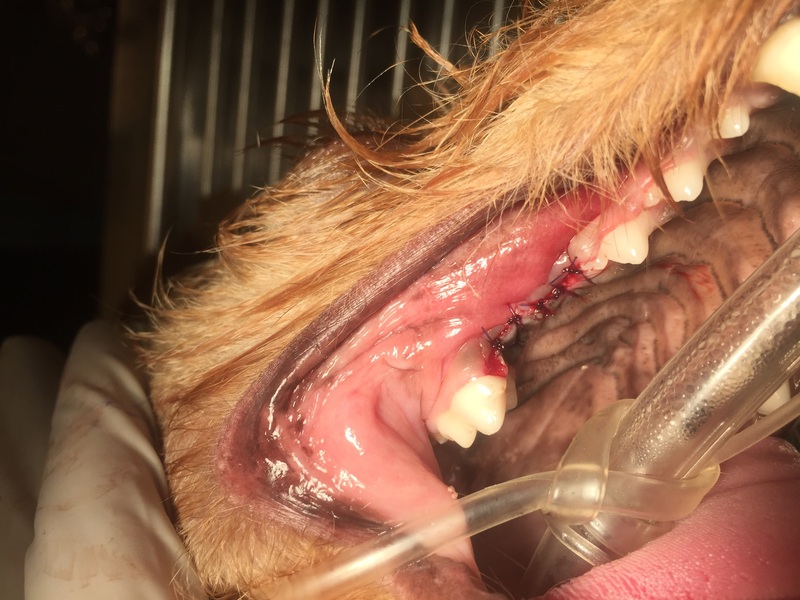 We then created an envelope flap, or freed up the gingival tissue from the bone, placed stitches in Tug’s gums to close this area and help it to heal. We placed sutures in the gingival to close his dental extraction. During Tug’s anesthesia we monitored his vital signs to make certain he was doing well. On our surgery procedures, we keep an eye on the EKG (the electrical current of the heart), the pulse ox (the oxygen-carrying ability of his blood), his blood pressure, his heart rate, his respiration rate, and his body temperature. 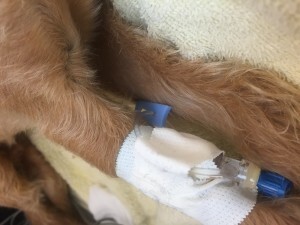 We are able to supplement his oxygen through his endotracheal tube, which also protects his airway, and can adjust his blood pressure, heart rate, and other parameters through medications and fluids into his IV catheter. 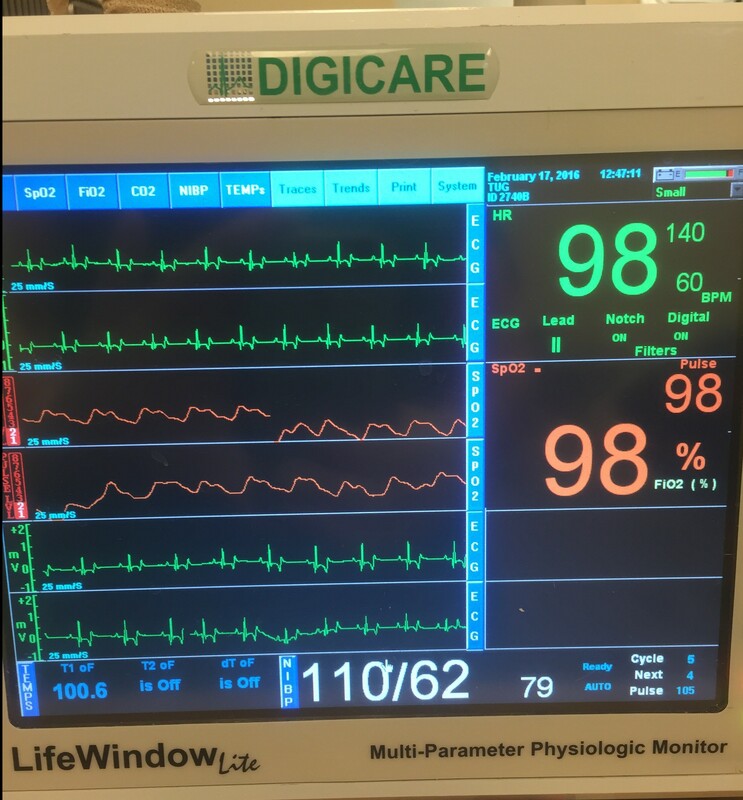 Our Digicare unit helps us monitor vital signs during surgery procedures, including EKG, blood pressure, oxygenation, heartrate, and body temperature. This is a picture of our anesthesia monitor, and the values it monitors during a typical surgical procedure. This information is saved in pdf and Excel documents that become part of the patient’s medical record. This constant monitoring of values helps us to identify concerns as soon as they occur, improving patient safety. 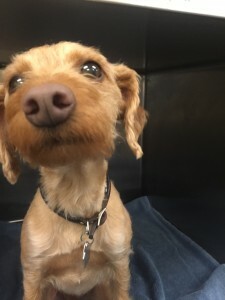 Thank you, Tug, for being such a wonderful patient! Once Tug’s surgery was finished, we moved him into recovery, reversed part of his anesthesia medications, extubated him and adjusted his pain medication to maintain his comfort level. 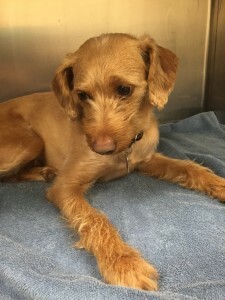 We typically need to monitor a young dog at least a couple of hours in recovery before they have their feet under themselves enough to go home. Tug was a real sweetheart, and a champ for his anesthesia and surgery. We wish him a speedy recovery, and hope he is back to himself in no time! We’re proud of another happy story out of our Parker road veterinary practice!